May 3, 2018 (London, UK) – In India, 337.0 million people, or more than a quarter of the population, will use a smartphone in 2018, according to eMarketer’s latest forecast. The number of smartphone users in India will grow by close to 16% this year—the highest growth rate of any country in the world broken out by eMarketer. 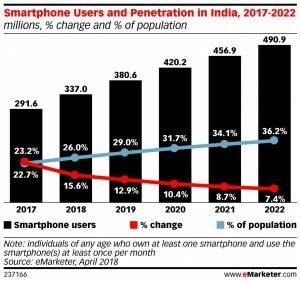 Since its last forecast, eMarketer increased its estimate for the smartphone audience in India by more than 31 million people. This uptick is thanks to the growth in smartphone usage in urban areas, where affordable smartphones are becoming widely available. From an advertising point of view, since TV draws large audiences in India, that is where the majority of ad spending traditionally has gone. In recent years, however, as smartphone penetration has increased, mobile ad spend has also risen. eMarketer expects strong double-digit growth to continue: Mobile ad outlays in India will rise by 75.0% in 2018, accounting for more than half of all digital spend.